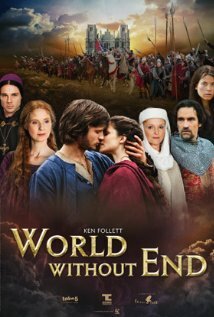 I recently watched the mini-series World Without End, which is based on the book by Ken Follett. The story centers around the English town of Kingsbridge. It follows the citizens of the town through the changes in the world at the time of the Black Death. I read the book so I wasn’t sure if I would like the series or not, but I was pleasantly surprised by the series. The series remained faithful to the book, which is something I appreciated. I really enjoyed this series because it didn’t romanticize life during that time. This is no trip to Medieval Times or a Renaissance Fair. It shows that life was really hard during that time. The decisions of those in power could cost you dearly. And you never knew exactly who was going to be in power. Things shifted constantly, and those shifts could make a hard life almost impossible to live. This series isn’t for those with weak stomachs or sensitive ears. There is a lot of violence. But then again they were violent times. And the language might offend some individuals with sensitive ears. But I don’t believe the author or creators of the series are using either just to gain attention. Both were part of everyday life in that time frame. Battles were bloody, and well how do you show life during the time of the Black Death without showing how ugly the disease was? Both the story and the characters in the series are well developed, and intelligent. It shows that while life has become easier in oh so many ways, people haven’t changed that much. There are good people, and there are bad people, but most of the time people are just trying to make a better life for themselves and their families. If you haven’t seen the series I recommend it to all of you, but keep in mind the warnings about the language and violence if you are easily offended by these things. And if you’ve seen the series let me know what you thought of it.